In my recent adventures in Turkey we were lucky enough to visit the amazing site of Ephesus on the Western coast of the country. This site is a must see and I certainly understand the hype but as an academic a few things struck me which need to be addressed. Namely the lack of accurate information that is actually given by the tour guides we pasted. So here is some accurate information on this awesome site. And remember (I see this everywhere) the tour guides are not always right, do your research before you go. Before I tell you about the site’s amazing archaeology, let me give you some background. Ephesus was established in the Greek period and was a major city all through to the later Roman periods. In Turkish it is now called Efes (yes like the beer) but the original Greek was Ἔφεσος which is where we take our English transliteration. In its height it was one of the largest cities in the Graeco-Roman world with a population of around 250,000 people in the first century BCE which certainly accounts for the large amount of material on the site. This site is huge! There are two modern entrances to the site at either end but the main entrance is down at the bottom of the hills in the valley where you are immediately struck by the massive theatre which sits at the end of a long colonnaded street leading to the city’s harbour. To the right of this theatre is the entrance to the main part of the site, the paved streets that are lined with houses, shops, bath houses, toilets, government buildings and of course the famous library of Celsus. If you do get a chance to visit this site then be warned it is easy to miss this path to the main site because of the huge number of tourists that dwell in the shade in that area and block the entrance. It took us three attempts to find it. The site itself has been inhabited since at least the Neolithic age. Excavations at the mounds in the area have demonstrated this. The habitation appears to be continuous as excavations at the Ayasuluk hill in the 1950s also turned up Bronze age material and a burial ground from the Mycenaean period. Artefacts included ceramics and tools around the ruins of the later site of the basilica of St John which you can still visit today. Hittite sources also tell us that the area held a settlement named Abasa which was in use under the rule of the Ahhiyawans before the Greek migrations took over the area in the 13th and 14th Centuries and established a new settlement. 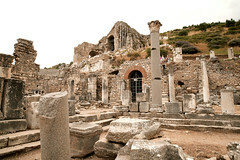 Ephesus was eventually founded as a colony in the 10th century BC. The mythical story of its origins involved King Kadros who was led to the place of Ephesus by the famous Delphic oracle. Though there are several other origin stories including those discussed by Pausanias and Strabo concerning the queen of the Amazons, Ephos, as a founder. Over the centuries the city saw many conflicts including attacks by the Cimmerians and the Lysians. The city though continued to prosper and became the base of and producing a number of significant historical figures. For instance, the poets Cllainus and Hipponax, the philosopher Heraclitus and the physicians Soranus and Rufus whos writings we still have today. The Classical period saw more conflicts with the Ionian revolt and the Peloponnesian war, in which Ephesus originally allied with Athens and then switched to Sparta in the later stages. During this time though it continued its upward climb and produced even great female artists like Timarate who is mentioned in Pliny the Elder as the painter who produced a fabulous representation of the goddess Diana. Alexander the Great liberated the site from Persian rule at the end of the Classical period and is said to have entered Ephesus in triumph. He even proposed to rebuild the Temple of Artemis which had been burned down in previous conflicts. After the death of Alexander though turmoil retuned under the rule of his general Lysimachus but after his eventual death, Ephesus became part of the Seleucis Empire and then was governed under Egyptian rule from the late 2nd century BC. Ephesus eventually became a part of the Roman Republic. All these influences and changes certainly led to a diverse site with establishments of buildings and institutions in all these periods. And the diversity continued as the site continued to function as part of the Byzantine era when Constantine I rebuilt much of the city and built a new public bath after the conflicts of the Roman period. Unfortunately though Ephesus has one enemy which they couldn’t defeat, the area is often troubled by earthquakes and one in 614 partially destroyed the city again. Considering all the conflicts it has seen, all the people and leaders, it is both understandable and surprising that so much is left of this site. And so now we have got through the date part and you have some background information let me tell you about the site itself from an archaeologist’s perspective. This site really is the archaeologist’s dream, I would happily dig on this site for years and years. You can see obviously that much of the site has been reconstructed which is fabulous and appears to be very well done. There are certain areas though that obviously stand out. The first of these being Celsus’ library. Apart from witnessing teen girls posing doing duck faces next to a status of wisdom (I’m so glad these statues are replicas because i can see the real ones throwing themselves out of their niches in horror), this is by far the most magnificent part of the site. It is truly a shame that the majority of people who visit the site do not know much about it. The library was built at the beginning of the second century CE for Julius Celsus Polemaeanus, who was the governor of the province, by his son Galius Julius Aquila and was actually built as a tomb rather than specifically a library. The façade is all that really remains today but once upon a time this building is thought to have been able to hold over 12,000 scrolls. As such it is thought to have once been the third richest library of the ancient world following the libraries of Alexandria and Pergamum. The library is an amazing building and to someone who understands its significance it really does stand for the virtues that are inscribed on its walls including knowledge, wisdom, intelligence and valour. Just ignore the posing tourists who are updating their Facebook profile pictures. While it appears that most people go round, look at the theatre and the library and then have an ice cream, this site has some truly amazing parts that you only really appreciate if you have researched them before hand or know about archaeology. The agora for instance, which was built in the Roman period played an important role as a social and political meeting place but the archaeology shows that the area was in use far before these functions. Excavations have brought to light graves from the seventh and sixth centuries BCE including an archaic sarcophagus made from terracotta. There is also a well preserved water reservoir in the corner of the ahora which demonstrates just how technically accomplished these people were. Its water was supplied by the Pollio Aqueduct which supplied the whole city from 5km away. The agora also contained stoas and a temple with dedications to the cult of Isis and evidence of rebuilding in different periods indicative of the turmoil the city suffered. The emphasis on the large theatre is well justified but the odeon is also a significant area. Unfortunately it was while looking at this I heard a tour guide tell tourists incorrectly that they used to have gladiator fights here…It’s an odeon, it is tiny, just no. First of all this area was used as a Bouletarion (a meeting place) for meetings of the Bouleia (council) and members of the Demos. It was also used for performances. The building is impressive though fairly small in size and demonstrates the wealth of its benefactors. It was orders by Publicus Vedius Antonius and his wife in the second century. Among other impressive areas of the site is the well reconstructed fountain of Trajan built at the start of the second century CE. It’s columns and pediments really give you an idea of what it would have looked like in its prime. It is an excellent tool for giving the visitors more of an idea of the ancient city and its statues are now in the museum. It is just a real shame that the Ephesus Archaeology Museum is shut for renovations for an entire year! There is so so much to this site it can not be written down. I could tell you about the temples, the gateways, fountains, houses, whole city but you have to visit it to appreciate everything. Either way I encourage that you look up this site and read more because this really was a site to remember. This entry was posted in Archaeology and tagged 10th century BC, Byzantine Empire, Celsus Library, Classical, Ephesus, Library of Celsus, Neolithic, Roman, Roman Empire, Rome, Temple of Artemis, Turkey.